I FIND it slightly humorous that Waikiki’s famous Royal Hawaiian Hotel which is aptly named “The Pink Palace” (as it is painted in pastel pink) names its premier restaurant Azure. Despite the conflicting contrast of colour names (but the Pink Palace does overlook the azure blue Pacific Ocean) – Azure is a wonderful Waikiki beachfront restaurant specialising in fresh seafood locally caught and bought daily from the fishing boats that come into Honolulu’s fish auction each morning. Azure is set in a pleasant oceanfront space. 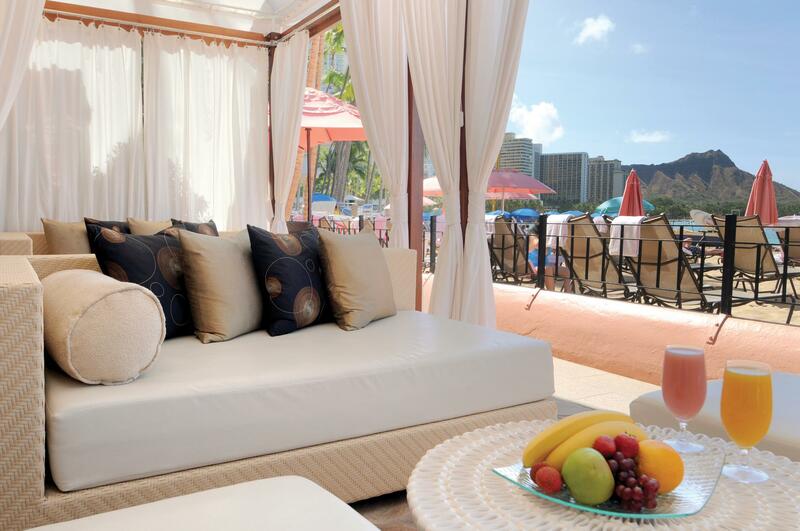 Outside, under the veranda, you can dine outside right next to the sands of Waikiki in a lavish cushioned cabana with a view of the beach and Diamond Head (and I dare say that they would be a very popular and hotly-contested option). 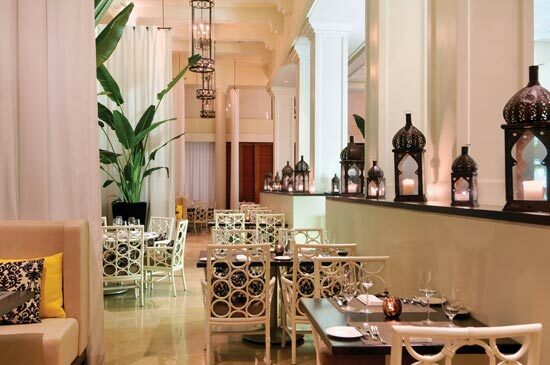 Inside it’s like entering a plantation mansion that has been blended with a touch of the Moroccan – white columns, polished floorboards and Arabian-style lamps that sit on the benches, bar and tables. Baroness and I decided to have an early and light dinner after getting back from our road trip from the North Shore (where we lunched at Fumi’s and had a dessert treat at the Dole Pineapple Planatation). Without a booking we couldn’t get a table (despite some free ones that remained free as we were leaving), so we opted to sit at the wooden bar where we were reassured that we would still get full service and the full menu. I get a little awkward sitting at the bar to dine. In Australia I find that you tend to get treated as an inferior as you are a walk in without a reservation. But thankfully it’s different in the good ‘ol US of A. You aren’t stateless – you’re still a welcomed guest (and we were joined by others). Barman, Robert, was most welcoming and accommodating and was able to make some suggestions that proved to be spot on and without a doubt his advice contributed to Azure being one of the top dining experiences we had on Oahu. The menu concentrates on seafood with local Hawaiian tropical influences (and a little fusion) and choosing such is perfect for the setting and the dining experience. It is balanced by some meat selections with a five-course tasting menu (that features both seafood and meat) for $75 or $99 with wine pairings. The tasting menu was tempting but after a day in the sun and to honour the pact Baroness and I made months ago to no longer do the degustation thing (because we tend to overindulge our slender frames to bursting point), we would share a salad and have a main course each. 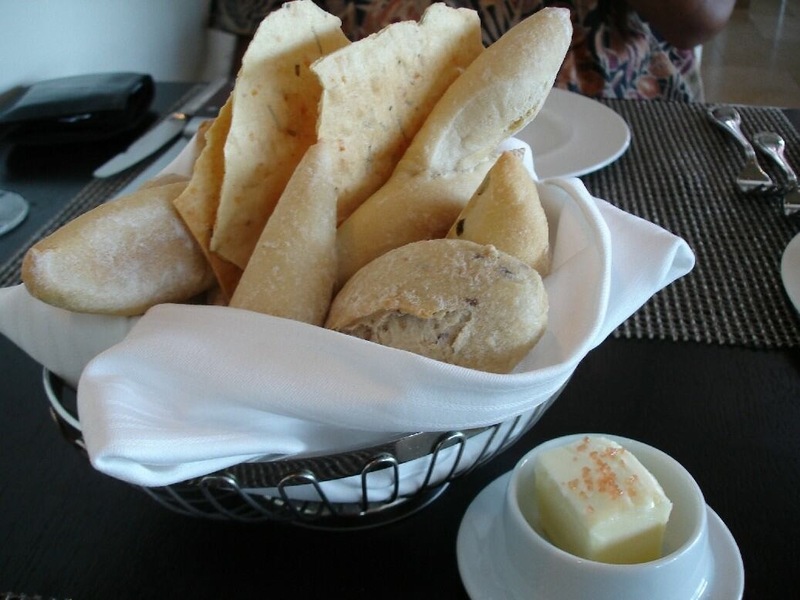 Robert brought us a basket of mixed fresh bread with house-made butter sprinkled with pink Hawaiian sea salt as well as some crab dip while we eyed the main menu. Salads are underrated. I am glad that we got one at Azure because now I have started to appreciate them again – especially if they are fresh and balanced with the right ingredients and dressing. 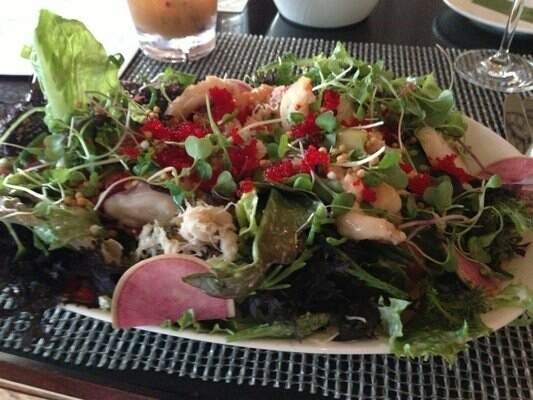 The ocean salad ($28) could be a light meal in its own right and included a good handful of fresh seafood: kona lobster, dungeness crab, prawns, big island abalone, scallop and octopus. The seafood was mixed with avocado, baby lettuce, drizzled with a tarragon and crème fraiche dressing and topped with tobiko caviar. Fresh and crisp, it was a summer dish perfect for outside dining and was an ideal accompaniment to the 2012 Trefethen Riesling from Napa, California ($48). Other entrees (appetizers) were Alaskan King Crab chowder ($13); hibachi garlic prawns ($19); sake-steamed Manila Clams ($18), and what would probably be a very rich and extreme dish: “kiawe smoked” petite Hawaii Ranchers butter-poached fillet and foie gras which is served with black truffle and Madeira ($29). Baroness and I had to have fish, especially after a day touring in the sun. I decided to choose one of the local “catches of the day” (the opakapaka which is a pink snapper) and had it simply cooked – that is seared. I could choose two sides and decided upon the oven roasted Twin Bridges asparagus and braised big island spinach with garlic chips. It was a nice piece of fillet that was heat roasted and served with a white wine herb and lemon caper sauce. A classic. Baroness can never resist scallops and ordered the seared Hawaiian yellow fin Ahi and Diver Scallop ($44) with “black magic” spice, sake braised spinach, prosciutto wrapped enoki mushrooms all in a port wine buerre rouge. The black magic spice is basically a Cajun-style blackened spice for the fish. It was pan fried and surrounded with plump scallops wrapped mushrooms and spinach. It all sat on a the rich wine sauce. Spicy with a rustic richness, the tuna was seared perfectly allowing its raw pinkness to shine through. Other mains (or entrees as they are known in the USA), included a chilled seafood menu with various seafood delights served on crushed ice and smoked Hawaiian swordfish poached in aromatic duck fat with purple potato, sea asparagus and a tomato salad ($38). If you aren’t in the mood for seafood then there are some carnivore options: grilled Colorado lamb chop (with a hibiscus red wine and almond crust for $49); Shinsato Farms’ porchetta ($40); and a Hawaii Ranchers rib-eye steak with creamed sweet corn, mushrooms, crispy shallots and bordelaise sauce ($52). Dessert was never going to be had but there are some temptations such as caramelised coconut flan ($11); Hawaiian pine “apple” crumble ($12), and the Azure cheesecake with a trio of sauces ($11). 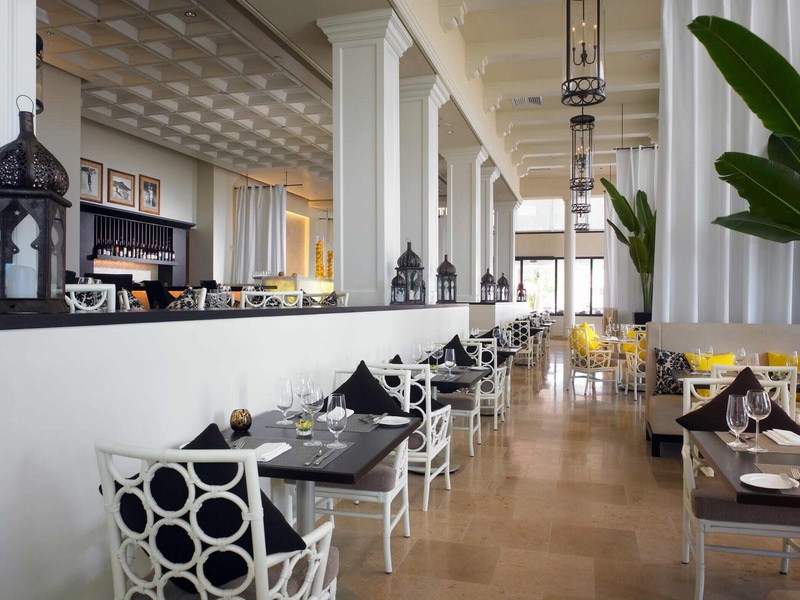 The verdict: A wonderful restaurant set in an ocean-front icon, Azure offers innovative dishes with quality and service expected of a top notch establishment. 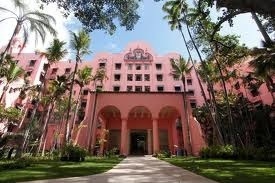 What: Azure (at The Royal Hawaiian), 2259 Kalakaua Ave, Honolulu, HI 96815, United States of America. Ate there: 17 August 2013. This entry was posted in Fine dining, Hawaii, Seafood, United States and tagged Azure, Hawaii, Oahu, Pink Palace, Royal Hawaiian Hotel, Seafood, Waikiki. Bookmark the permalink.